Many experts talk about how to answer interview questions and, a few, how to dress or write a thank you note. But, if you haven't interviewed for a while (or ever), you may want to make sure you have the very basics of interviewing - Interview Soft Skills. Here is a series of articles I wrote for examiner.com. Corresponding videos are available on Youtube. Practice - really over-preparing (see Interview Tip #1), Prepare your notes (Tip #2), Have appropriate, comfortable clothes to wear (see Interview Tip #3), Interview Tip #4 shared the importance of visiting the location the day before, and Tip #5, was to relax. They all addressed preparation and tips for before the interview. 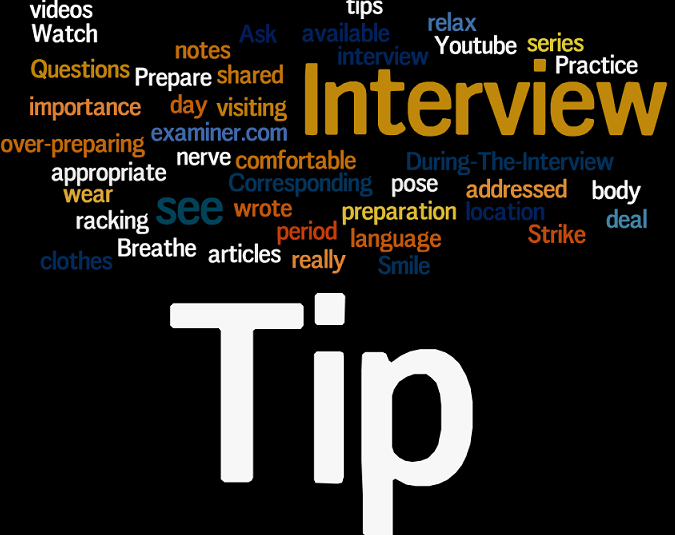 Tip # 6 (Breathe), Tip #7 Strike a pose, Tip #8 Smile, Tip #9 - Ask Questions and Interview Tip #10 (Watch your body language) deal with that nerve racking During-The-Interview period. I hope you are preparing for an upcoming interview and find this information helpful. If you need help, just let me know! Email me. Good Luck!